Barack Obama told Prince Harry that people in leadership positions can risk reinforcing people's prejudices by what they say on the internet. 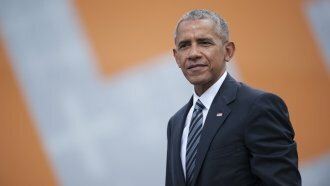 Former President Barack Obama thinks leaders need to be careful about how they use social media. In a BBC Radio interview that aired Wednesday, Obama told Britain's Prince Harry that people in leadership positions can risk reinforcing people's prejudices by what they say on the internet. "All of us in leadership have to find ways in which we can re-create a common space on the internet. One of the dangers of the internet is that people can have entirely different realities. They can be just cocooned in information that reinforces their current biases," Obama said. Obama said meeting face-to-face could be a solution to help counteract extreme views on social media. Obama's interview was wide-ranging, but this segment is grabbing headlines because his presidential successor, Donald Trump, is known for being very outspoken on Twitter. Obama never mentioned Trump by name. Beyond social media, Obama and Harry also spoke about the pressures of the presidency and how Obama felt when he left the White House in January.